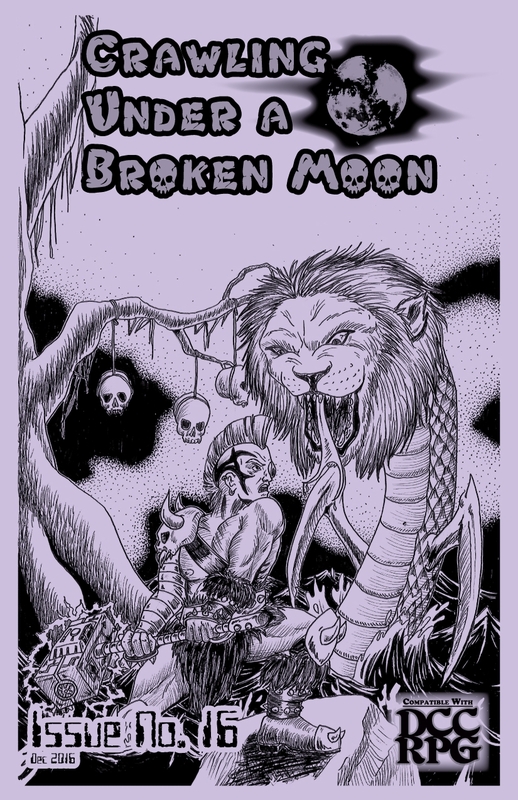 Crawling Under a Broken Moon #16 was written by Reid San Filippo, Kevin Searle, Jon Carnes, Sean Ellis, Anna Costa (with ideas from Claytonian), and Quinn Coffman. Cover art is by Diogo Nogueira (front cover) and Nate Marcel (back). Interior art is by Nate Marcel, Claytonian, Matt Hildebrand, James Yoder, and Anna Costa. It is published by Shield of Faith Studios. 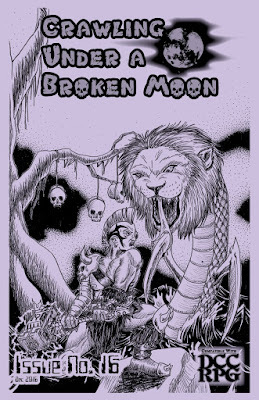 This issue, like Crawling Under a Broken Moon #10, offers a selection of monsters for use in your Umerican campaigns. Most of the creatures in this issue are purely post-Apocalyptic, and therefore of less use in other Dungeon Crawl Classics campaigns. That said, even a standard DCC campaign may travel to another world (for example, in Peril on the Purple Planet, Against the Atomic Overlord, or The Dread God Al-Khazadar), and these creatures may suddenly become more appropriate. A standard DCC milieu may also have had a more technological past, as in Silent Nightfall. The Black Cloud: This creature, by Kevin Searle, is a sentient cloud of pollution with a radioactive core. It seems like something out of a 1970s ecological horror movie, an episode of Thundarr the Barbarian, or a manifestation of Hate from Fritz Leiber's Lankhmar stories. Or a combination of all three. As an aside, one of the nice things about the Crawling Under a Broken Moon monster collections is that they all come with "Adventure Hooks" that give you an idea of how to create a scenario or encounter revolving around the creatures described. At the time of this writing, Reid San Filippo has just "appeared" on the second Glowburn podcast. Apparently, Reid is an "off the cuff" type judge, so having thought about how creatures might create scenarios would (presumably) be of benefit to him. As much more of a "prepare ahead of time" judge, this sort of information also helps me. Not every adventure hook is golden, but they are a good inclusion. Business Revenant: The creation of Jon Carnes, this is an un-dead "project manager", often followed by a hypnotized entourage trying to complete some ages-old business plan. In fact, their goal may be nothing more than unearthing the process map for their project, lost aeons ago. Cihuateteo: Created by Sean Ellis, this is an Aztec spirit of the dead re-written as the victims of an ancient and mystic nanovirus. If nothing else in the collection scares your players, this should be it. Data Elemental: Humanoid shaped lines of code which can siphon data...including your knowledge and memories! This is a cool and entirely appropriate monster to be found in the ruins of Umerica. I assume that the entries without attribution, such as this one, are the work of Reid San Filippo. This creature introduces the plane of Eternal Memory, as well as "the area between the plane of Elemental Air and the realm of Empyrean Dynamics" and similar area "between the plane of Elemental Earth and the realm of Empyrean Dynamics." An "attractive Magnetism Para-elemental" is mentioned, which suggests that there must be a repulsive Magnetism Para-elemental as well. Demolishroom: Gigantic mobile mushrooms that knock down buildings and give off "shroomanoids" which help it collect (and consume) the dead. One can easily imagine an evening's gaming revolving around ending the menace....although, once deceased the danger is increased! Frab: Take a crab-like plant and give it both a penchant for vibrations and the skills of a thief. Then give it biological grenades. Gun Elemental: A creature from the plane of Elemental War, gun elementals are a TPK waiting to happen. Actually, they are not waiting. They are seeking out the opportunity. But, the potential to gain an armory's worth of firearms may make the PCs seek their probable deaths anyway. Their opposte number is "the Mercy Elemental native to the plane of Unending Tranquility" - making the planar cosmology of Crawling Under a Broken Moon interesting indeed. Lion Snakes: Gigantic snakes with lion heads, these monsters would be at home in any flavor of Dungeon Crawl Classics milieu. Organic Data MULE (Mobile Ubiquitous LAN Extension): The creation of Anna Costa (with ideas from Claytonian), this is any creature whose DNA has been encoded to contain data. The extra DNA makes them subject to additional mutations, so that all sorts of strange MULEs can be created. Tables are provided for judges to do so, but you will want to use them to springboard your own devilish ideas. The Posse of Perception: Author Quinn Coffman offers what, to my mind, is the strangest entry in this issue. It is a cult, which grew from a gang, and each tier of the cult is focused on a single sense. This has biological repercussions. Reindire: That Santa is an Umerican divinity was revealed in Crawling Under a Broken Moon #11. Naturally, the god of giving needs minions, right? These humanoid reindeer are just the ticket. "They will do their best to not harm anyone but their intended target, chosen by Santa, and they will NEVER harm a child by ANY direct or indirect action. They will hold to this even if it means dying repeatedly over the course of the mission." The adventure this brings to mind: The Tick Loves Santa mixed with The Preacher. Tru-Pet: A 100% artificial pet from a parallel universe that never experienced the Cataclysm. If you want a PC to gain an animal companion which can remain viable for a long time, this is it. While this entry is not Blood from A Boy and His Dog, but it could be with very little work on the part of the judge. The PCs may never even know that their newest ally is a lab that was made in a lab. Wraith Rider: "Empowered by an unknown spirit from the plane of Eternal Unrest after suffering a traumatic violent death, a murdered human may transform into a Wraith Rider." The obvious inspiration for this being is Marvelous, but the actual execution is its own thing. It fits in very well with the darkened highways of Umerica. Note also the additional plane added to those of the Crawling Under a Broken Moon cosmology. WK2 Curse of the Kobold Eye is a level 1 adventure written by "Weird Dave" Olson and published by Cut to the Chase Games. 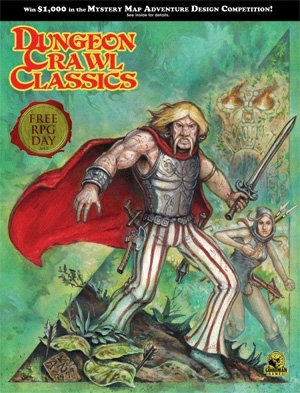 It is a Dungeon Crawl Classics conversion of an adventure originally written for multiple systems, including 5th Edition Dungeons & Dragons and Pathfinder. This is the second part of the "Wrath of the Kobolds" series. Any conversion from one system to another can have problems, but this is even more pronounced when the conversions attempt to present exactly the same adventure using varied mechanics. This is less true where two systems contain roughly similar expectations for the game milieu, such as 3rd Edition Dungeons & Dragons and Pathfinder, and more true where there are larger divides in expectations. There is no byline for the DCC conversion in this case, but it is lazier than it should be. For instance, on page 7, a giant spiders' lair contains a long sword +1. Such an item shouldn't have appeared in Dungeon Crawl Classics, which has a system for unique magic items. It could easily have been listed as a finely made longsword doing +1d damage on the dice chain without affecting the mechanics much. Or the converter could have given it a full write-up, making it something unique and interesting. The problem with this second method is that the non-DCC versions of the adventure suffer by comparison. The rivalry between gnomes and kobolds was established long ago in Dungeons & Dragons, and it makes sense to use gnomes in a series of adventures focused on kobolds. But gnomes are used so frequently in the series that they really require a Dungeon Crawl Classics gnome class. 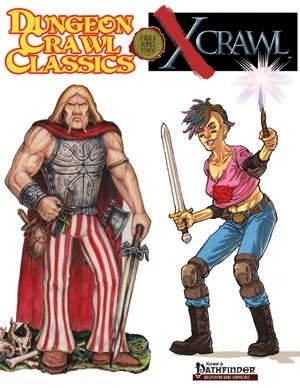 I personally suggest using the gnome class by Yves Larochelle in Crawl Fanzine #6 as an adjunct to these adventures. The adventure itself is interesting enough. Placing the characters under a curse (hopefully through events in the previous installment of this adventure series) not only provides motivation, but is in keeping both with Appendix N fiction and the suggestions in the Dungeon Crawl Classics core rules. There are interesting things to do, and locations that should be interesting to the players. There are interesting NPCs for the judge to role play. Names like "Kra-Moth-Ka" and "Markar Laan" read like something out of a Lin Carter pastiche of Robert E. Howard or Edgar Rice Burroughs. That's a plus. There are also areas and characters here that the players are likely to return to. This sort of campaign milieu building increases the value of any product, this one included. But be aware that you will likely want to go carefully through this product, adjusting treasures and adding touches to make it less "Dungeons & Dragons" and more "Dungeon Crawl Classics". I find that I like the voice of the author here. I enjoy reading the "Weird Dave's Notebook" sidebars, because it is almost always worthwhile to get a glimpse inside the thought processes of other Game Masters. An unusual curse from their last brush with danger befalls a party of adventurers! Haunted by the spectral image of a one-eyed kobold warrior, the heroes must race to unravel the mystery of the curse while avoiding death at the hands of their ghostly visitor. Can they stop the effects of the curse in time before it consumes them entirely? A harrowing journey awaits them! Dungeon Crawl Classics #88.5: Curse of the Kingspire, was written by Harley Stroh and published by Goodman Games. 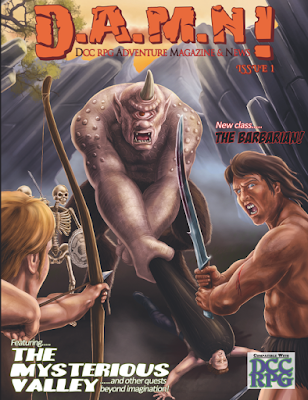 It is a 2nd level adventure, originally written for 4th Edition Dungeons & Dragons and converted to Dungeon Crawl Classics by Daniel J. Bishop. The original 4th Edition adventure was written as part of the "Master Dungeons" series published by Goodman Games. Disclosure: I am the Daniel J. Bishop who converted this adventure from 4th Edition rules. Somewhat related to this, Terry Olson has now been added to the roster of official Goodman Games converters, with his conversion of Grimtooth's Tomb of the Warhammer by Ken St. Andre and Steve Crompton. Also, a shout-out to Goodman Games' new weekly column, Forgotten Treasure. It is always nice being asked to do a conversion. Having done official conversions from 3rd Edition and 4th Edition Dungeons & Dragons, I find that 4th Edition requires a bit more work, but Harley Stroh's writing and vision makes it all worthwhile. 4th Edition skill challenges, in particular, need work to be translated to a less crunchy system. Many examples of skill challenges are rather banal. Stroh's skill challenges, however, actually increase the pulp adventure feel of the work...reading the original, I could very much feel the Appendix N vibe. 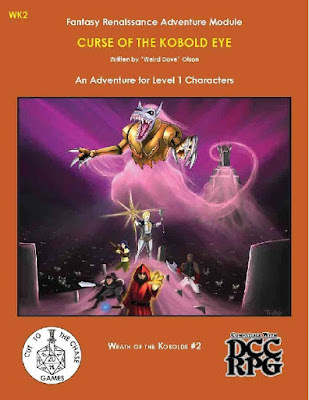 In some ways, this adventure and its companion in the "Master Dungeons" series, Dragora's Dungeon, feel like direct antecedents of the Dungeon Crawl Classics rules. Making sure that these challenges were somehow incorporated into game play, without being a series of rolls, was important to me. I hope that I succeeded. Statblocks are also far larger in 4th Edition, and use a scaling system altogether different from that of previous editions of Dungeons & Dragons. The focus on miniature-based combat means that creatures may have powers designed to take advantage of a grid...not always the best choice for Dungeon Crawl Classics. I tried to make the encounters feel the same, even if they do not strictly play the same. The original adventure makes use of the Eladrin from 4th Edition, a group of elf-like fey beings with a limited power of teleportation. I wanted to make use of the sense of them, while leaving Wizard of the Coast's intellectual property behind. The result in this module are the "Elder Kith", which are called "Elder Kindred" in my own Through the Dragonwall, mostly to avoid confusion with the Kith of Peril on the Purple Planet. There is a time travel element to the adventure that is wonderfully presented. Harley Stroh knocked it out of the park. And there is a magic sword which cannot help but remind one of Stormbringer in Michael Moorcock's Elric series. Very little work was needed to adjust this weapon for Dungeon Crawl Classics - as far as I know, Harley created the first DCC-style sword before the game existed. 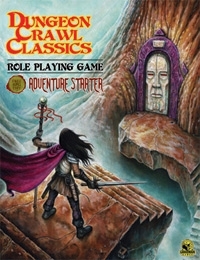 Curse of Cragbridge was written by Paul Wolfe and published by Mystic Bull Games. This adventure is designed for 0-level to 2nd level characters. There are plenty of graphics on two separate pages, by illustrators Jason Sholtis, Wayne Snyder, Jacob Blackmon, Malcolm McClinton, and Gary Dupis, which the judge may use as visual aids. 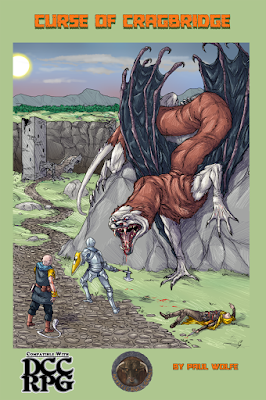 This is a site-based adventure influenced by a strong storyline going back to the time when Cragbridge Keep was more than an ominous ruin. The keep is haunted, and the story must be discovered to end the ancient curse, but there are plenty of physical foes to make things difficult for the players in their exploration. As an adventure, it brings to mind William Hope Hodgson. There is enough material here for several sessions, possibly spanning across multiple levels of play, with logical reasons why creatures respawn and traps are reset. The hauntings themselves are well worked out, with both encounters with spirits and physical manifestations of the curse. These physical manifestations are an especially good touch, because they turn players' general greediness back against them. Monsters are both interesting and appropriate to the adventure. 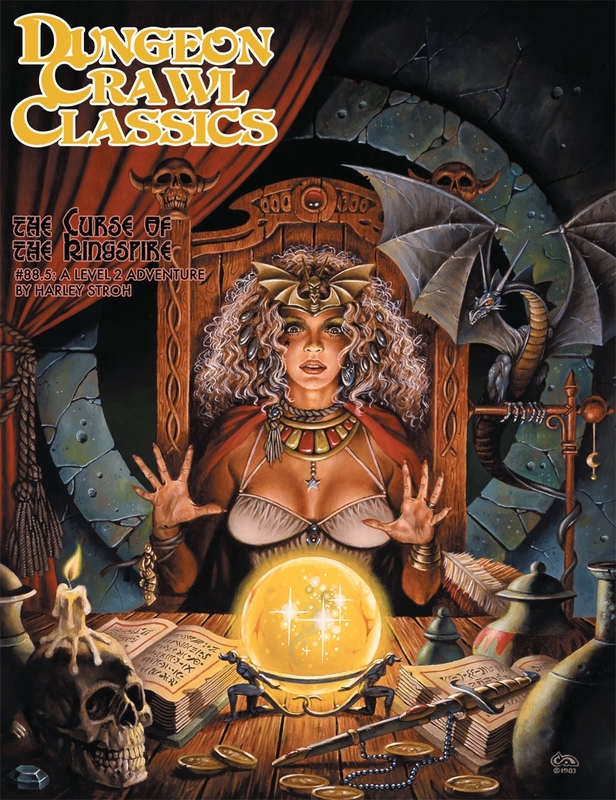 There are new magic items, of course, but this is Dungeon Crawl Classics, where magic items are meant to be new. In addition, the adventure includes blink as a 2nd level wizard spell. Because of Mystic Bull Games' generous OGC policy, this spell can be used in derivative works by other authors. For five hundred years, Cragbridge has stood abandoned and cursed. Within lurk the haunts and spirits of those that served Lord and Lady Etheril. Some of these ghosts inhabit the forms of strange insectile humanoids while others guard tombs deep beneath the shattered bridge tower. Recently, the good knight Sir Dougal Skavok disappeared in the ruin, and when a search party returned, they too were missing a few members. The party carried strange treasures found there: coins marked with a double-headed raven, gemstones of great value and other ornate and gilded items. They also spoke of the evils that lurked in Cragbridge, cursed forever by the vengeful Lady Etheril.